5/2/2015: Spent most of the day resting at the Ruins. Woke up to a doe (It was an experimental character, and I can't remember the name and I feel bad about that. :C ). Saw (Morven) nearby, he must have lead that doe to her. The doe must've heard what happened and wanted to confront the dragon. The doe circled the serpent many, many times. Hydra couldn't really do anything cause of her limp, plus she was tired. She could tell this doe was trying to provoke the dragon into attacking. Hydra refused and stood her ground. (Was that doe trying to bite Hydra? I couldn't quite tell, sorry. :c ) No fight broke out and both (Morven) and the doe left the Ruins. More resting. The next day Hydra was resting with Natasha, (Kenelm) and Ta'vha. While she was napping the spirit woke her up and offered help to heal her wounds. Although Hydra didn't anything about (Kenelm) she appreciated the help and was quite impressed to see golden tears heal up the nastiest wound that was causing her to limp. Although the dragon still felt sore, she felt significantly better. The limp was gone so she is now able to move around better. Plus she finally got the name of that water dragon. Thanked him for helping her that day with fighting some members of the demon clan. 4/29/2015: After a week worth of resting, her wounds are healing nicely and soon will be fully healed. Noticed that she's being stalked by members of the demon clan more often. Feels anxious and alert. Has also been thinking about asking who that water-dragon is that helped her in that fight that one day. Later in the day she was resting in the birch when she noticed a familiar group stalking her. On a hill she could see (Hammel) and (Morven) and somewhat behind her in the distance was (Andor). Pondered whether she should charge at the wolf, but she wasn't at full strength so decided to head off towards the ruins. Could hear small footsteps behind her but she didn't pay any attention to it. Short nap. Woke up the unpleasant sounds of howling from (Cressideah). The dragon could tell this demon was enraged that her family was attacked...again. Hehehehe. Well come on, come at me. The demon restlessly circled and paced trying to provoke the dragon. It worked. 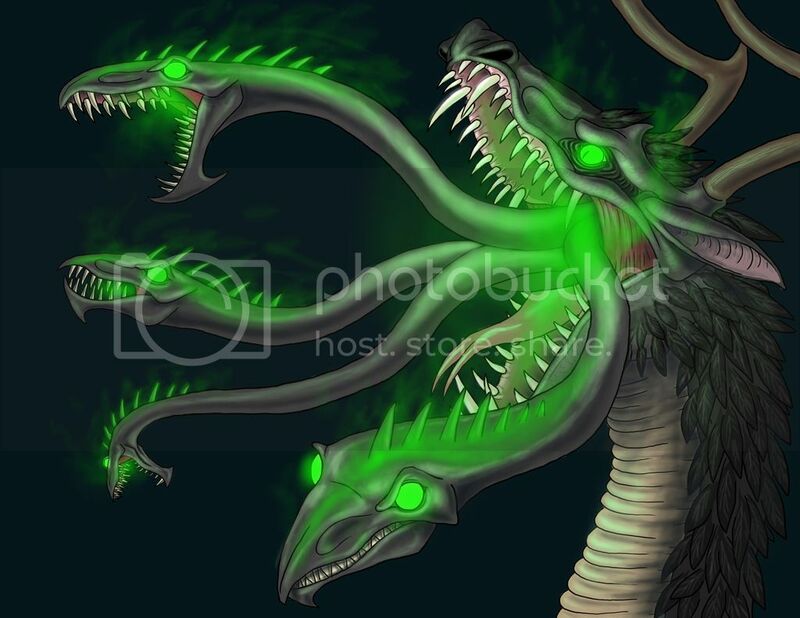 Hydra lunged herself at the demon, attempting to bite, claw, and stab as many times as possible. It was only a matter of time before (Hammel) saw what was happening and joined in. The she dragon ignored the wolf mostly. Not the best idea considering she received many bite wounds around her side and flank from him. Though at the moment the she dragon was so enraged that she didn't feel much pain. Noticed that the demon (Cressideah) started to retreat. Oh hell no. Chased her multiple times, trying to cause as much damage as possible. At some point a stranger (Otto) joined in and started attacking the demon clan members? Seems so. Eventually the battle died down and the dragon could see (Hammel) urging (Cressideah) to get out before she takes too much damage. Hydra wanted so badly to pursue but discovered she has a bad limp after being attacked from behind so much. Damn. Returned to the ruins to rest. 4/24/2015: Most of the day was peaceful. Hung out with her family mostly. Felt rather bored actually. Later in the day decided to cause some trouble at the demon clan. Since they didn't seem to directly attack Hydra when they were hunting her that one day when she was at the Crying Idol. So she decided to bring the fight to them. Hehehehe. Started off by just staring at them at first. 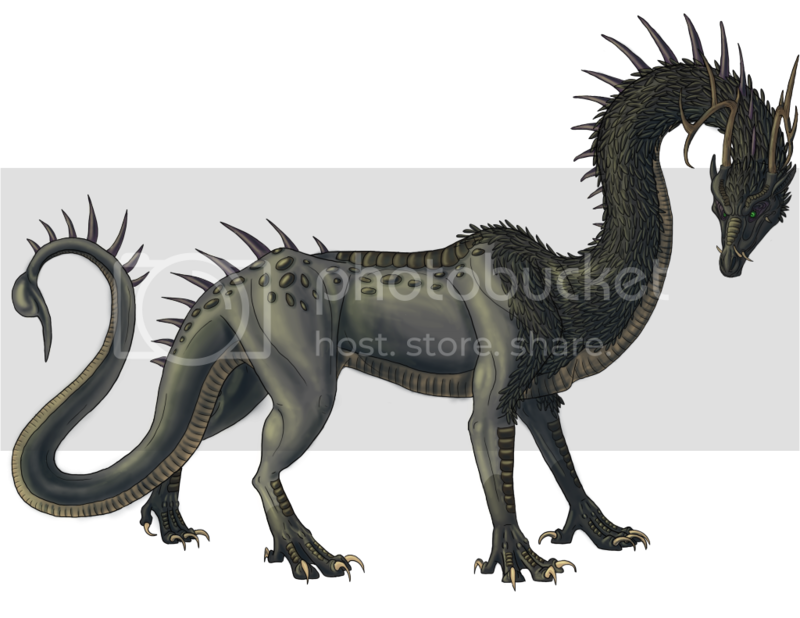 The brown canine (Vasilisa) was the first to surround Hydra by going behind her. A white and red canine (Hammel) was the first to circle around the dragon. A smaller creature (Morven) was watching from a distance. The tension quickly escalated until a fight broke out. Recieved several gashes around the flank and stab wounds on her neck. As well as some nasty bites on her ankles cause of the small creature (Morven). As usual the she dragon was outnumbered but she's gotten used to it by now. Suddenly, just out of now where, a large reptile jumped right into the fray with no hesitation. A water dragon?? Interesting. Helped to balance out the fight. After it seemed that the canines were retreating? Maybe? Not entirely sure, the fight just sort of ended. Spent the rest of the day resting in the Big Oak. 4/18/2015: Not much has been going on. Been sleeping a lot and keeping an eye on her family. Resting a lot which does wonders to alleviate stress. 4/7/2015: The only major thing that happened today is when the she dragon chased (Andor). She wanted to get her message. Bully and harass Natasha, and there will be hell to pay. Felt victorious in her goal especially after seeing that lizard tremble a few times. Not much else happened, except that she kept coming across a particularly interesting creature (Ynma) on more than occasion. Most creatures resemble something something...not this one. Seems very alien. 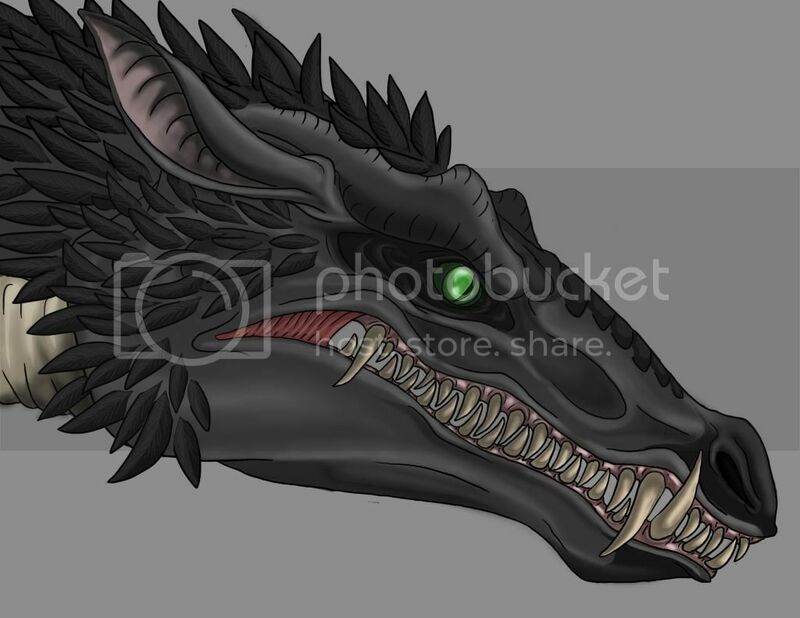 Species: Wyvern dragon with Chimeric-like features. Size: 2 meters at the shoulder. Size Reference. - The first individual to approach the dragon without fear. Tolerates his presence more so than others and will protect. - Saw that this fawn is important to Kestrel. Protects. - Seems to be a friend of Natasha. - This horse likes to provoke the dragon to get her to chase him. Ugh. Hasn't seem around lately. - A marine-like creature that stalks the shallows of the pond. Never trusted since she met him. - A dragon she came across one day. The white dragon didn't trust her the moment he spotted her. That seemed to change after they fought one day. Feels very unsure about him. - A pup she encountered at the ruins. Annoying little thing likes to nip at the dragon's tail when given the chance. - A nuisance that seems to revel in bullying Natasha. Will not tolerate him anywhere near Natasha and may even target him as a prey item. - Did NOT like the presence of this demon the very second she discovered it. Fought her several times and sometimes stalks the demon. - An obvious ally of Ractera. Fought this demon as well.